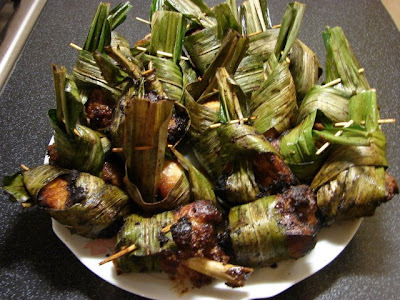 Pandan leaves are not just excellent for S E Asian sweet cakes and puddings, it is also great for some savoury recipes like this popular pandan chicken. 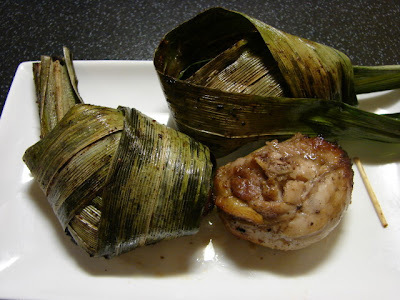 It is quite easy, the method of wrapping with the leaf is up to you as long as you can secure a piece of the leaf round the chicken to give it the unique flavour. Great as starter or serve with a meal. For the marinate I have 3 recipes, one Chinese, one Malay and one Thai. Put spice paste ingredients in a small blender and blitz till very smooth, if the blender is a bit struggling add some water and continue blending till you get a smooth paste. Once the chicken has been marinated then prepare the wrapping. 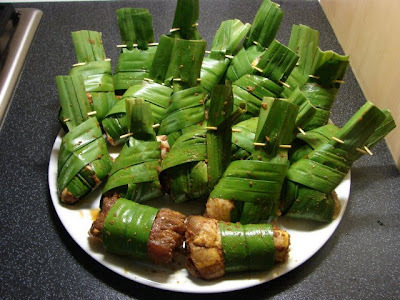 You will need quite a few pandan leaves, do use fresh not frozen. This picture showed two different flavours, one Chinese and one Malay qty as recipes above using a mixture chicken thighs and drum sticks about 10 pieces per recipe. To wrap like this go to the bottom of this link for the technique and secure each with a cocktail stick. You need one full length of the leaf to wrap one piece of chicken like that. If you can’t do it, just wrap it round like a band and secure with cocktail stick like those two pieces showing in the front of above picture. Once you have wrapped the chicken then deep fried, shallow fried or baked. I normally use 1 cup of oil and fried in a wok few pieces at a time till all done. To bake, brush the wrapped pieces with oil then baked at 190 – 200C for around 30 -35 minutes depending on size of chicken pieces. Chicken breast takes a lot less time, chicken with bones will be longer.